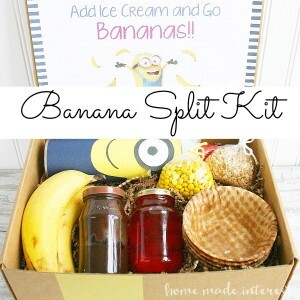 Banana Split Kit for Your Minions Lover! - Home. Made. Interest. 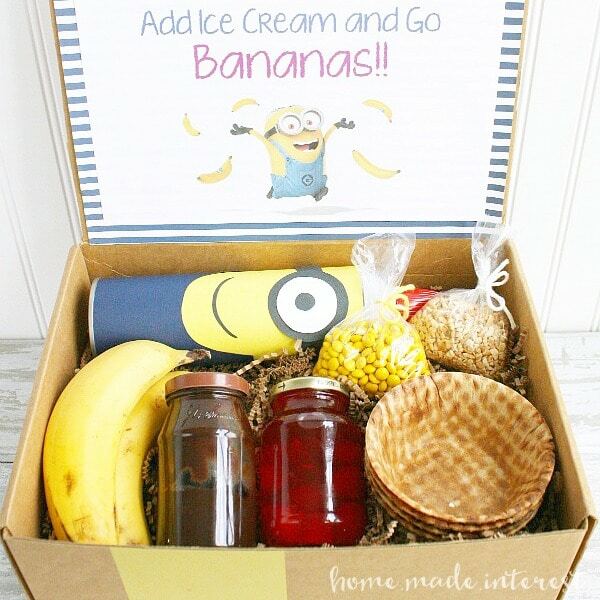 Home » Create » Crafts » Banana Split Kit for Your Minions Lover! Banana Split Kit for Your Minions Lover! 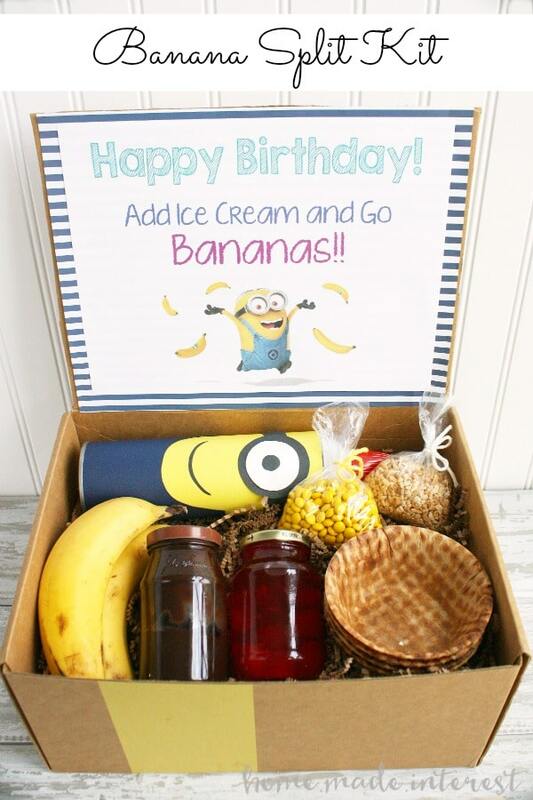 Make a simple Banana Split Kit as a fun spin on a gift basket for your Minions fan! Has Minions fever hit your house? All of the kids in my life, and more than a few adults, are so excited about the new movie! I went to the beach with my family and my brother -in-law’s family a couple of weeks ago and it was all my nephew would talk about. I must have heard “Bananas!” a thousand times. So, of course when it came time to buy him a birthday gift this year I had Minions on my mind. I had mentioned the other day that I have a ton of summer birthdays to celebrate. Every week I’m either dropping a card in the mail or heading to a birthday party. Since the next birthday I have coming up is my nephew’s, and the Minions movie is in theaters now, I got him a movie theater gift certificate. In keeping with the theme Walmart had a whole display of Minions cards that come with cute little Minions clips so I picked up one of those to put his gift certificate in. 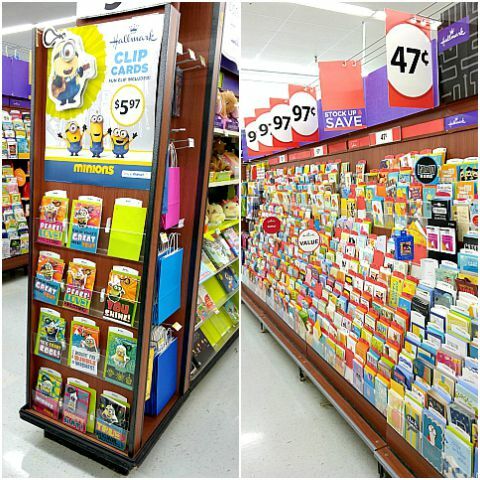 While I was there I did a little proactive birthday shopping and stocked up on $0.47 Hallmark value cards. You can only find them at Walmart and it’s an awesome deal for someone like me who can never make a decision on which card to get. My friends and family regularly get two cards for their birthday because I just can’t decide which one I like better. I was able to get enough cards to make it through the rest of the summer birthdays, with a few extras, for under $10! I still wanted my nephew to have something to open (other than a card) on his birthday though. So, since I’m such a cool aunt I made him this Banana Split Kit. It has everything you need to make a banana split, bananas, chocolate fudge, cherries, waffle bowls, yellow candies, chopped nuts, and a can of whipped cream. I even made the whipped cream can look like a Minion for him. It was simple. I just wrapped it with yellow and blue scrapbook paper and then used black and white scrapbook paper to make googles and his smile. I filled a box with shredded paper as filler and nestled each of the ingredients into it. I added a sign to the inside of the lid that reads: “Happy Birthday! Add Ice Cream and Go Bananas!” Banana splits plus a trip to the movies to see the Minions movie should equal one happy birthday boy! So now tell the truth, do you ever give people two cards because you just can’t choose? Be honest!! 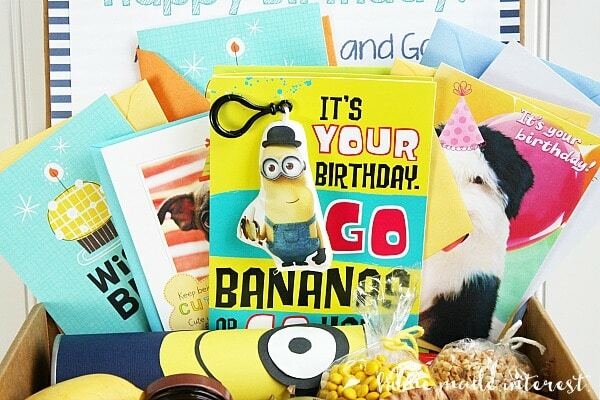 I love the idea of a Minion party box – we just saw the movie and the kids are wild about Minions right now. I may just have to throw an ice cream social. I think this might make a cute wedding shower gift, too – prepared at home date night! Thanks for sharing! I love banana splits and minions! What a super cute idea! Most definitely pinning for later! I love it! Thanks for sharing your creativity! Oh my, oh my – how cute !!!! And you are right about the adults loving the Minions too because my husband gets the biggest kick out of them !!!! LOL And he loves ice cream – maybe this is on his birthday list. Thanks for sharing. Love this idea. 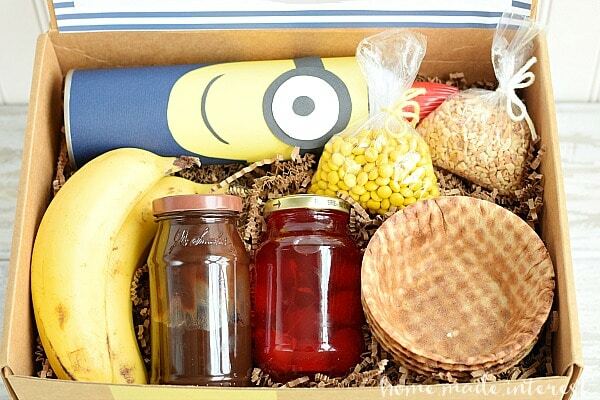 Whether you are into Minions or not, I reckon you would love this little parcel. What a very unique idea. It’s cute but I’m giving it to my 5-year-old nephew and I believe he will not appreciate this kind of setup that I will let him do some sweet treats cause he is too young for that though this is really a wonderful idea for older ones. But I will still use the idea of boxing my gift just like this but different gifts inside. Thanks though!